Spectacular GRANDVIEW PREMIER 4/3 with 3 CAR GARAGE, HEATED POOL, 12 Ft Ceilings, Crown Molding, Elegant Kitchen with Granite, Expresso Cabinets, STAINLESS APPLIANCES, Double Built In Ovens, Cooktop, Spacious Master Bedroom with double walk in closets with custom organizers, En Suite with Large Roman Shower, granite, 3 spacious bedrooms with double closets, bedroom 4 being used as office also has double closet with custom organizer, Guest Bath with Tub and Shower, POOL BATH with access from lanai, 20" Ceramic Tile throughout, Exquisite Landscaping and brick pavers, Roll Up Entry with no steps, 36" Doorways with double French Doors leading to Master Bedroom and Den, Whole House Generator, Pool has solar panels and heat pump, waterfalls, lighting, Exterior and Pool Deck recently painted, Replaced exterior lighting, Garage Floor Painted, installed pull down stairs, solar roof exhaust, garage door heat deflectors, storage racks, ADT Alarm System, Lanai Dust Blocker, Brick Paver Dog Run on side, Extra Height on Garage Doors. Fabulous Outdoor Living Space. Close to Brownwood Paddock Square, Evans Prairie Country Club and Championship Golf Course, Eisenhower Regional Recreation Center, Soaring Eagle Softball Complex, Shopping and Restaurants. H Frame Track in Master Bedroom available separate or will be removed with any damage repaired. 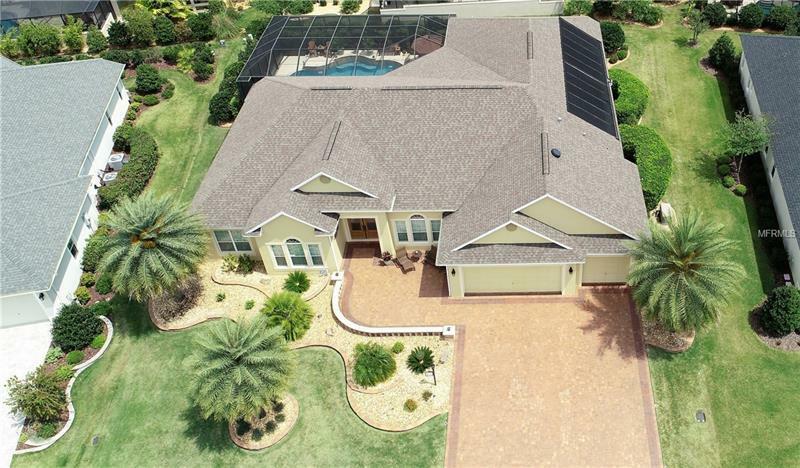 PLEASE WATCH OUR VIDEO OF THIS EXCEPTIONAL HOME!